The following events bring together some of our favourite things about the festive season: great food, traditional Christmas markets and atmospheric settings. Read on for our top picks. There’s no better time of year to visit Lanhydrock than in the winter. You can enjoy a walk around the stunning grounds or visit the house, which is open everyday during December expect Christmas Day. Children can also meet Father Christmas on select days and receive a magical gift. The Queen Anne manor house at Trereife near Penzance is the perfect setting for a Christmas fair. Opening on the Friday evening with carol singing and live music, this event gives you the opportunity to explore the historic rooms of the house itself alongside the traditional craft fair. Truro’s Lemon Quay will play host to the annual ‘Made in Cornwall’ Christmas fair at the end of this month. Visitors will have the chance to browse almost 100 stalls, and choose gifts and treats that are guaranteed as being made in Cornwall. 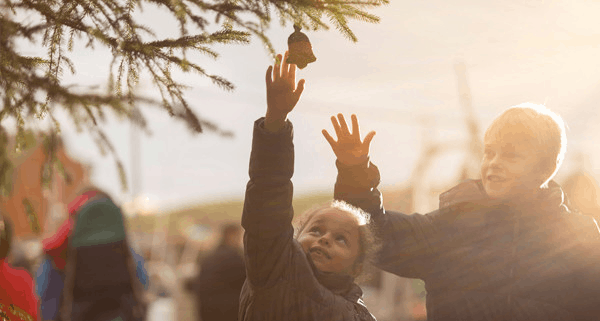 A must-visit for foodie gifts and top cookery demonstrations, the Fifteen Cornwall Winter Fayre at Watergate Bay will welcome more than 20 local producers who will be selling seafood, meat products, breads, and foodie treats perfect for your Christmas table. The Fifteen Cornwall apprentices and Origin Coffee will be serving up warm food and drinks throughout the day. Over 40 West Country producers will be in attendance at this year’s Cotehele Christmas Food Fair, selling everything from local cheeses to artisan liqueurs. This December, the Padstow Christmas Festival returns for its eight year to celebrate what the town does best: food and drink. Visitors can see some of the biggest culinary names from across the country lead a host of cookery demonstrations and gather inspiration for their own Christmas feasts. The festival will also be hosting a large Christmas market, an atmospheric lantern parade and a spectacular fireworks display on Padstow harbourside. This list wouldn’t be complete without Fowey’s very own Christmas market which is now in its 11th year, and staged across two sites in town, to cope with demand from traders. For three days, Fowey is lit up with a lantern parade, a Victorian funfair, carol singers and entertainment. Don’t miss Father Christmas’ arrival by tug boat! Last but definitely not least is Lostwithiel’s Dickensian Evening, which sees the whole town get into the Christmas spirit with stallholders, performers and local shopkeepers dressed in Victorian garb. For younger visitors there’s a Santa’s Grotto and storytelling sessions, and food and drink stands are open all evening.